NoClone uses True Byte-by-Byte Comparison that ensures the duplicate files uncovered are exactly the same in content. 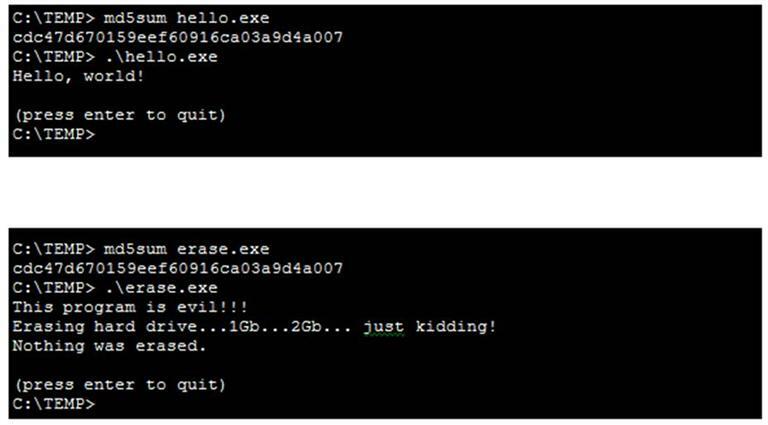 Here are two files with same MD5 hash value (cdc47d670159eef60916ca03a9d4a007)*. Therefore, comparing exact content is the only way to ensure accurate result. Compared with finding duplicate by CRC or MD5 hash, NoClone uncovers duplicate with 100% accuracy. To avoid false duplicate report as a result of MD5 collision, NoClone use the technology of True Byte-by-Byte comparison. With intelligent file filter, a list of suspected duplicate files will be scanned out. With exactly content comparison, duplicate file found is reliable. By opening suspected files together and compare their content respectively, we can find true duplicate files easily.